Long the standard in boiler room call center applications, recording calls is often a requirement outside the call center. There are any number of reasons to record calls for including compliance, clarity and certainty and just management of customer quality service. There are a variety of recording solutions in the market and they all have very different feature sets. Do you need the ability to annotate calls? To search on more complex parameters that time and date? If an employee is being recorded and transfers that call to the HR Director of the company, should that segment of the call be recorded? Do we want to record inbound calls only? Both inbound and outbound? Do you have multiple locations in your deployment? Do employees have the right to start and stop recordings? Add notes? You will also have to consider how recording are to be stored and for how long? This can have a huge impact on hardware requirements. Just some of the characteristics you might want to consider as you look for for a recording solution. The list of features is long and there are many options to chose from. It is best to get a solid requirements document together and to make sure that you fully understand that recording alone is not all there is! ShoreTel has an optional recording function that can be very effective! It can be installed as a single server solution or as a multiple server, multiple site solution. It can record all calls, or just in one direction only. You can select who is recorded and you can also select the archive location and time frame. The solution is deployed on a ShoreTel server, either HQ or DVS depending on the deployment model. There are actually four modules that can be installed: the recording server; the client side, the web player and the administrative module. The solution uses the integrated recording functionality of the ShoreTel phone system and most of the usual user group and class of service settings apply. Generally you will create a route point with a call stack as deep as the number of calls you want to simultaneously record, and put it on the server that will host the recording application. You will also need a route point for the player and you will need to create a user who will proxy the recording functionality. The server install is very simple and conforms to the usual point and click install expectations of a Windows server application. The configuration is very simple, just provide the route point extension number, note the port for recording and click install! The Administrative application enables you to configure the specifics of the recording server and to create profiles. 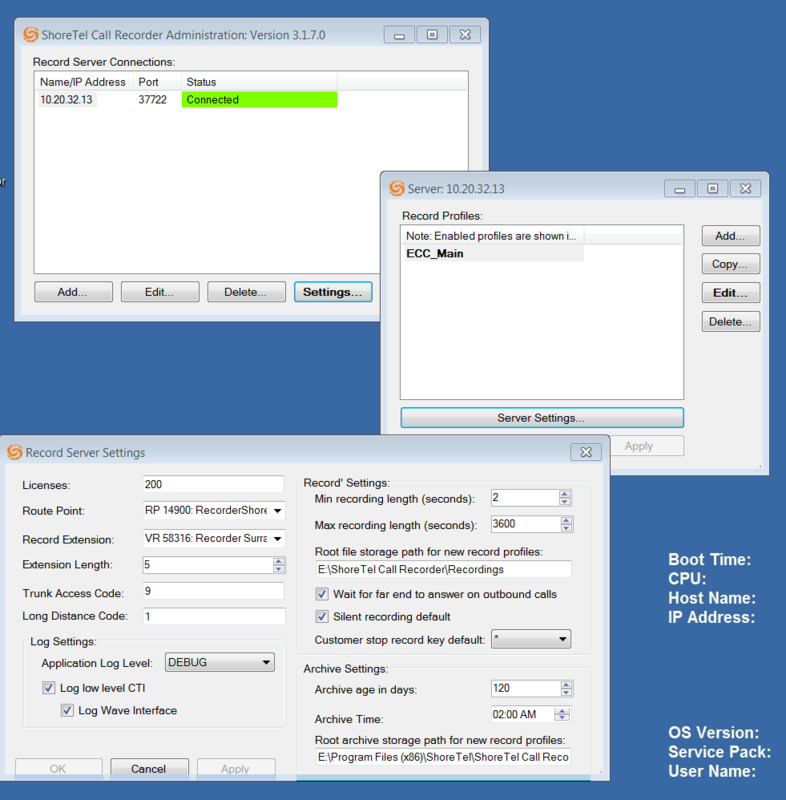 This application can be installed on the server or on a PC that can reach the server. The configuration options are very easy to understand and simple to enter. Basically they deal with where files should be stored and for how long. You also have the option of either saving the recordings to a file system, or saving them as a voice message. You then create profiles that are used to customize different groups of extensions. 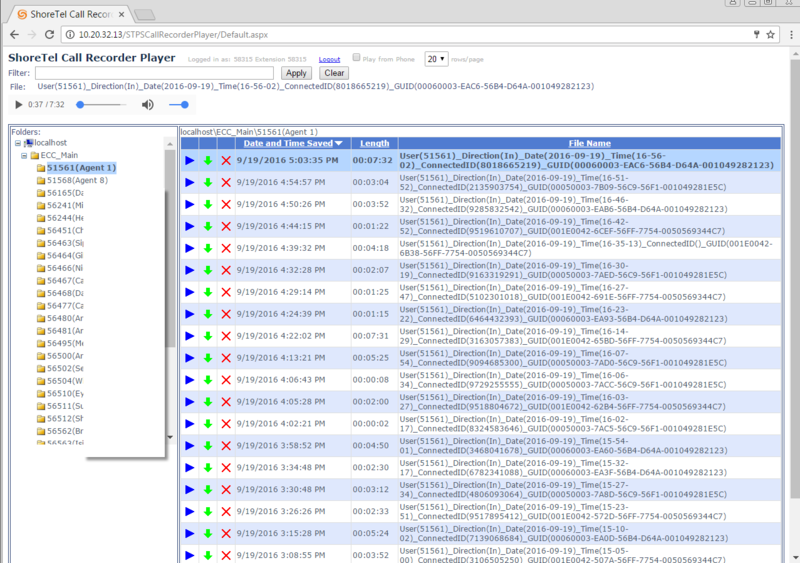 For example, you might want persistent recording for some extensions and not others. This means that the recording continues even if the call is transferred. Do you want inbound and outbound recordings? And exactly who should be recorded! The profile also dictates if recordings are to be made all the time, or sampled as a percentage or by a defined schedule. The client side application is installed on a pc and is optional tray icon. You would use this only if your profile enables users to start and stop recordings and to tag recordings. If this is not a privileged that you want to extend to those be recorded there is no need to install this optional application at each desk. The use of the client is profile dependent. The last application defines the player and is very useful for visually managing recordings. You can use a phone to play recordings , but most folks find this web application to be more useful. The application must be installed on a server as it uses IIS, but the recordings are played locally on a windows machine that has a sound card! Each extension is listed and there is a time and date stamp on the recording file. You have the option of storing other file information, like ShoreTel call properties to enrich the identification of a recording. All in all, the ShoreTel Recording Application is a sweet suite! It gets the job done and at a price point that compares more than favorably with the third party Recording applications found in the market place. We recommend it for both call center and general recording applications when you are on a ShoreTel iPBX! Give us a call and we can help point you in the right direction or get this installed and configured for you!